"Berkley Medallion Edition September 1975"
Copyright © 1973 by Science Fiction Writers of America. ISBN derived from SBN on copyright page. Individual stories' copyright and publication information on page after copyright page. 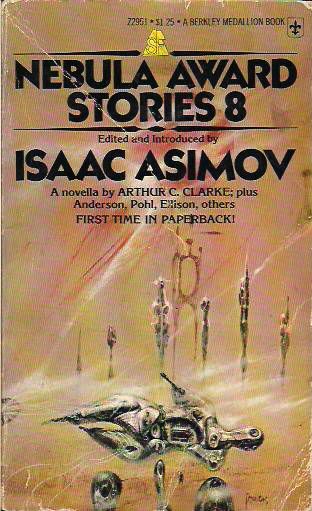 "Edited and Introduced by Isaac Asimov" on title page and front cover. Each story preceded by commentary. Cover artist not credited in book. Signature "Powers" at bottom right front cover. Z2951 in pricing line at top front cover. "First Time in Paperback!" on front cover.